sagittal view of tonsils and throat anatomy. For the structure in the cerebellum, see cerebellar tonsil. When used unqualified, the term most commonly refers specifically to the palatine tonsils, which are masses of lymphatic material situated at either side at the back of the human throat. The palatine tonsils and the nasopharyngeal tonsil are lymphoepithelial tissues located near the oropharynx and nasopharynx (parts of the throat). Tonsils tend to reach their largest size near puberty, and they gradually undergo atrophy thereafter. However, they are largest relative to the diameter of the throat in young children. These immunocompetent tissues are the immune system's first line of defense against ingested or inhaled foreign pathogens. Tonsils have on their surface specialized antigen capture cells called M cells that allow for the uptake of antigens produced by pathogens. These M cells then alert the underlying B cells and T cells in the tonsil that a pathogen is present and an immune response is stimulated. B cells are activated and proliferate in areas called germinal centres in the tonsil. These germinal centres are places where B memory cells are created and secretory antibody (IgA) is produced. Recent studies have provided evidence that the tonsils produce T lymphocytes, also known as T-cells, in a manner similar to, but different from, the way the thymus does. A pair of tonsils after surgical removal. 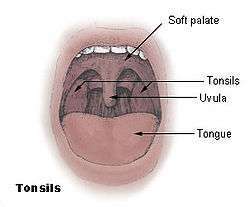 Tonsils can become enlarged (adenotonsillar hyperplasia) or inflamed (tonsillitis) and may require surgical removal (tonsillectomy). This may be indicated if they obstruct the airway or interfere with swallowing, or in patients with frequent recurrent tonsillitis. However, different mechanisms of pathogenesis for these two subtypes of tonsillar hypertrophy have been described, and may have different responses to identical therapeutic efforts. In older patients, asymmetric tonsils (also known as asymmetric tonsil hypertrophy) may be an indicator of virally infected tonsils, or tumors such as lymphoma or squamous cell carcinoma. Tonsillitis is a disorder in which the tonsils are inflamed (sore and swollen). The most common way to treat it is with anti-inflammatory drugs such as ibuprofen, or if bacterial in origin, antibiotics, e.g. amoxicillin and azithromycin. Often severe and/or recurrent tonsillitis is treated by tonsillectomy. A tonsillolith is material that accumulates on the tonsil. They can range up to the size of a peppercorn and are white/cream in color. The main substance is mostly calcium, but they have a strong unpleasant odor because of hydrogen sulfide and methyl mercaptan and other chemicals. Tonsil enlargement can affect speech, making it hypernasal and giving it the sound of velopharyngeal incompetence (when space in the mouth is not fully separated from the nose's air space). Tonsil size may have a more significant impact on upper airway obstruction for obese children than for those of average weight. As mucosal lymphatic tissue of the aerodigestive tract, the tonsils are viewed in some classifications as belonging to both the gut-associated lymphoid tissue (GALT) and the mucosa-associated lymphoid tissue (MALT). Other viewpoints treat them (and the spleen and thymus) as large lymphatic organs contradistinguished from the smaller tissue loci of GALT and MALT. ↑ "Tonsils Make T-Cells, Too, Ohio State Study Shows". Ohio State University. Ohio State University, Comprehensive Cancer Center. March 4, 2012. Retrieved March 27, 2014. ↑ "Circulating phospholipase-A2 activity in obstructive sleep apnea". International Journal of Pediatric Otorhinolaryngology. 76 (4): 471–4. 2012. doi:10.1016/j.ijporl.2011.12.026. PMID 22297210. ↑ Wang, JH; Chung, YS; Cho, YW; Kim, DY; Yi, JS; Bae, JS; Shim, MJ (April 2010). "Palatine tonsil size in obese, overweight, and normal-weight children with sleep-disordered breathing". Otolaryngology--head and neck surgery : official journal of American Academy of Otolaryngology-Head and Neck Surgery. 142 (4): 516–9. doi:10.1016/j.otohns.2010.01.013. PMID 20304270.